Goodspeed's Michael Price with Eli Baker who was in the theater's production of Mame! 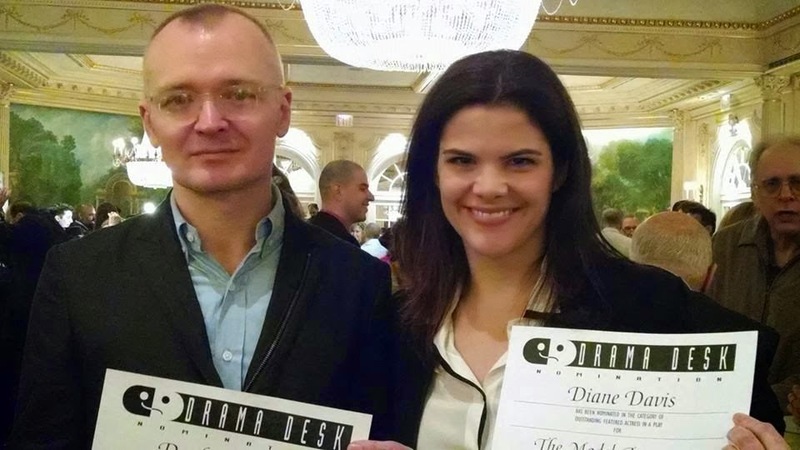 The CT Critics Circle Awards were announced at a ceremony and reception Monday at Westport Country Playhouse. 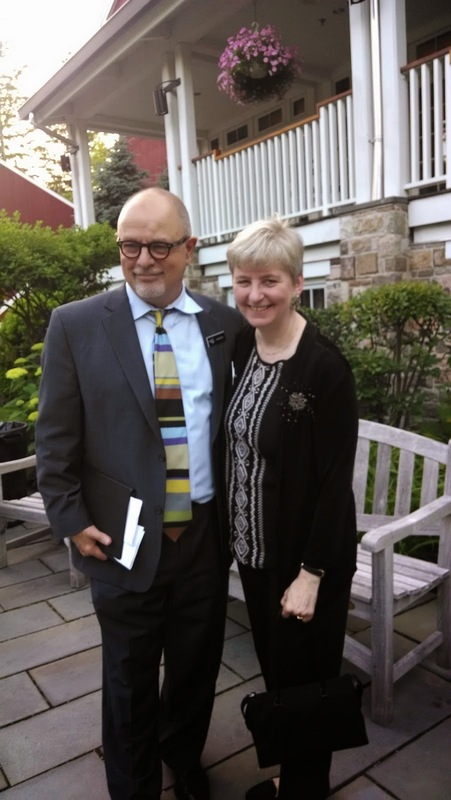 Goodspeed's Executive Director Michael Price, who has produced more than 200 shows (19 of them going on to Broadway) and who will retire at the end of this season, also was honored. In a moving speech, he said he never didn't want to go to work and never thought of what he did as work, really. 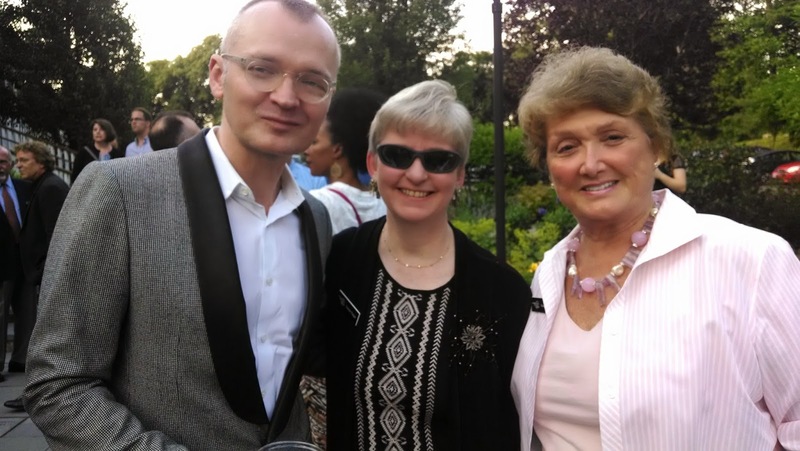 The evening was hosted by actor and Playhouse Board Member Jake Robards. Laurie Wells and Bill the Bard (a.k.a. 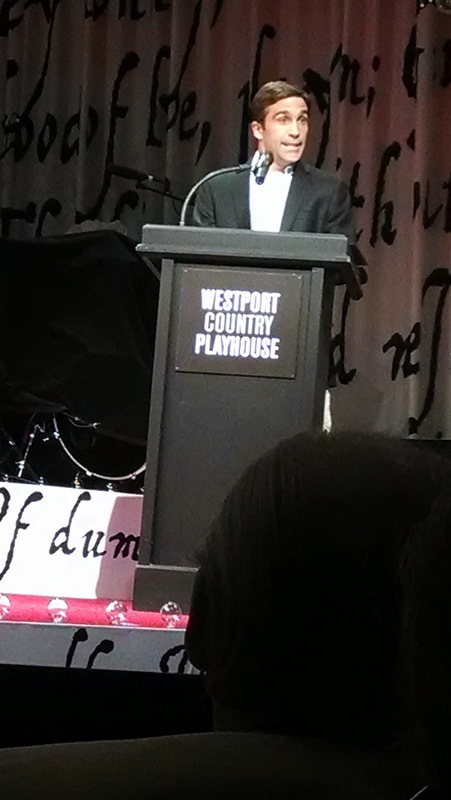 Steven DeRosa), currently in Sing for Your Shakespeare at Westport Country Playhouse entertained the crowd of critics, nominees and art lovers on hand. Sing's co-conceiver and musical director accompanied. Special awards were given to Bill Joe Armstrong for his songs written for These Paper Bullets! at Yale Reportory Theatre, A Broken Umbrella Theatre in New Haven and playwright Athol Fugard, who received the Killen Award, for his impact on Connecticut, American and world theater. With The Hartford Courant's Frank Rizzo, who wrote the script for the evening. 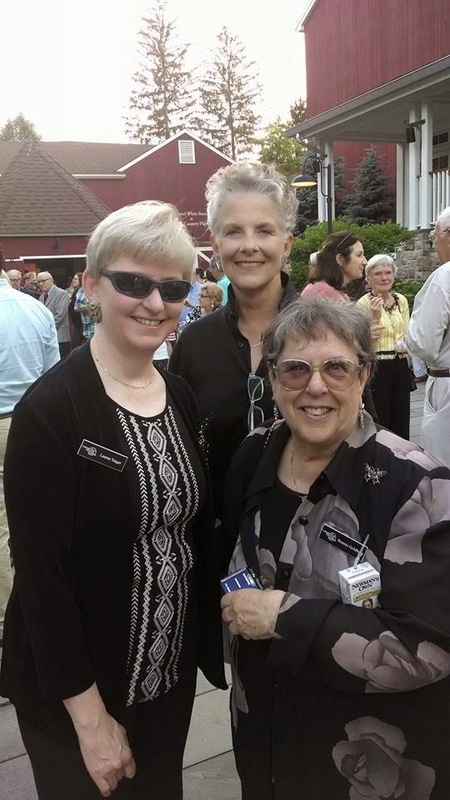 With fellow critic Bonnie Goldberg, right, and friend Marie Reynolds, one of the producers for Shakespeare on the Sound. A bold and exciting method of storytelling whisks us through leadership lessons learned and the triumph of the human spirit during adversity, regardless of the time, in Endurance at Long Wharf Theatre. Split Knuckle Theatre’s dual tale of a modern insurance manager trying to weather the current economic downturn and of a turn-of-the-20th-century ship captain encouraging his men trapped by ice on their way to Antarctica, offers some of the cleverest and innovative storytelling we have seen on stage. The show began at UConn and begins the summer season at Long Wharf and the theater group plans to make New Haven its home. Jason Bohon, Andrew Grusetskie, Christopher Hirsch and Slit Knuckle Artistic Director Greg Webster play all of the roles and tell the tales using a minimal number of props that are repurposed in effective and amusing ways. At the fictional BMI Insurance Company in Hartford, Walter Spivey (Hirsch) and his coworkers dread the cutbacks they know are coming. In an unexpected twist, Walter gets promoted instead of being laid off, but feels unprepared to lead the team through the unrealistic goals set for them by upper management in the face of a hiring freeze and lack of resources available to complete a growing number of tasks. In desperation, he turns to the business management section of the library, where he stumbles upon Endurance, a leadership manual (this part is true) by Ernest Shackleton who is credited with saving the lives of 27 men stranded with him on an Antarctic ice floe for almost two years. It was a different kind of freeze, but Walter finds some parallels for helping him lead his team. Songs, precision movement and quick-change props, aided by exceptional lighting by Dan Rousseau, tell the two stories, which look for ways the human spirit can survive, even in the hardest of circumstances. The ensemble members are all trained in method of collaboration and creation of French theatrical artist Jacques Lecoq, whose physical techniques inspired works like The 39 Steps, Peter and the Starcatcher and War Horse. A table becomes part of a ship, a bucket being hoisted aboard The Endurance suddenly is a trash receptacle in the office. Ice threatening to sink the ship is conveyed in some movement and sharply designed sounds (uncredited, though Ken Clark designs the music). It’s ingenious as well as economical. Amazing to me was the fact that 100 years and setting could be changed in the blink of an eye by a subtle lighting change or the flick of wrist. The performers play characters as well as inanimate objects like a bathroom sink, an elevator or an alarm clock. The story is engaging and humorous – it’s part "Office Space," part National Geographic -- all amazingly staged into a thrilling 90 minutes without intermission. The piece, devised and performed by Bohon, Grusetskie, Michael Toomey and Greg Webster, according to press information, has traveled the world. Split Knuckle formed in 2005 in London, beginning with an adaptation of John Steinbeck’s “The Pearl,” which received a 5 Star review from the Scotsman at Edinburgh festival. Since that time they have traveled and performed in 19 different counties and across the United States. 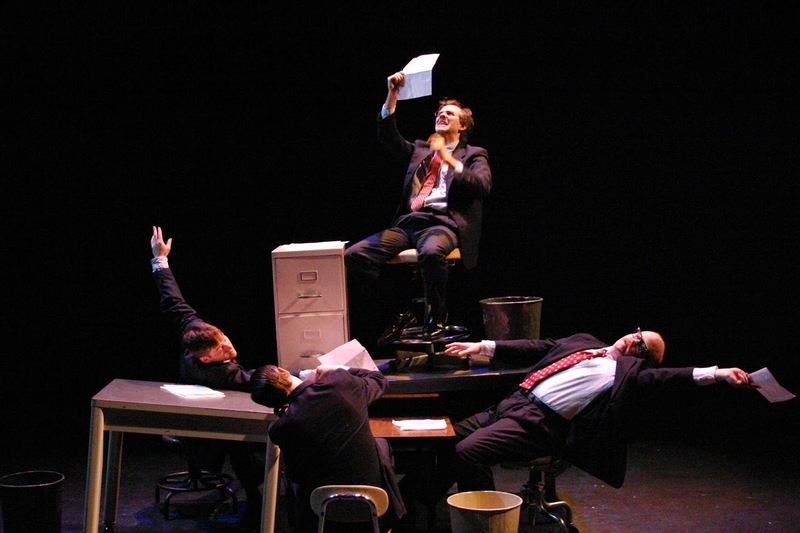 Webster, a New Haven resident and University of Connecticut professor in Movement Theatre said Endurance was inspired by two things: a dream in which he saw a business man being swallowed by a photocopier, and his long admiration of the unique heroics of explorer Ernest Shackleton. These two ideas taken in tandem prompted a series of improvisations and exploration that resulted in the play’s beginnings at UConn. Working at a residency at UConn in 2008, Webster encouraged actors, musicians and writers to all be together in the rehearsal room at the same time, exploring different ideas using their respective disciplines. They would then improvise based on a theme, and writers would create scenes based on their improvisations. Playwriting here is credited to Nick Ryan. The company is creating two new devised pieces, which will be released in the spring of 2015. For more information about Split Knuckle Theatre, visit www.splitknuckletheatre.org. Endurance runs through June 29 at Long Wharf, 222 Sargent Drive, New Haven. Tickets are $55 with student discounts available. 203-787-4282; www.longwharf.org. 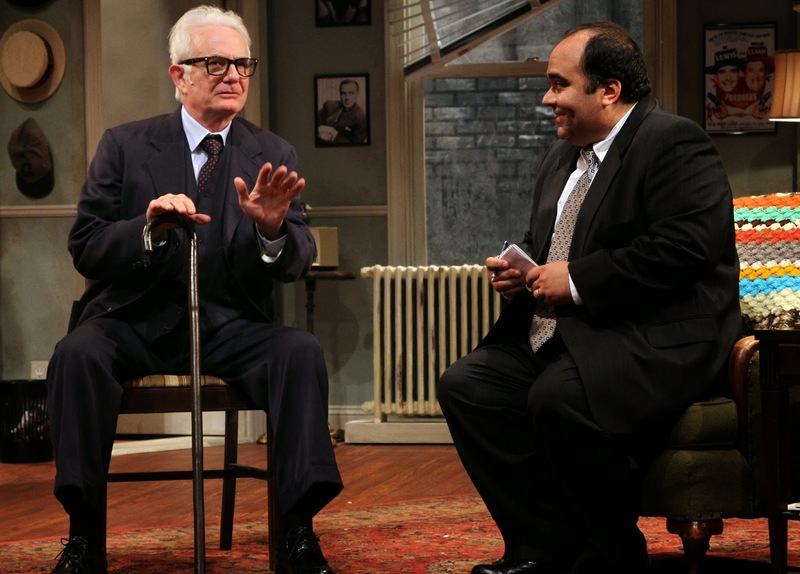 Director Vincent J. Cardinal finds a wonderful onstage rapport among veteran actors Jerry Adler and Richard Kline and UConn alum Richard Ruiz to propel CT Repertory Theater’s fine production of Neil Simon’s 1972 comedy The Sunshine Boys, the second of this season’s Nutmeg Summer Series offerings. The comedy team of Lewis and Clark (Kline, TV’s “Three’s Company,” City of Angels, first national tour Wicked and Adler, “The Sopranos,” “Rescue Me,” “The Good Wife,” CRT’s “I’m Connecticut”) once dominated vaudeville, but a falling out broke them up after 43 years in show business. Now, Clark sits alone watching TV in his rundown hotel room (designed by Tim Brown) waiting for his nephew/manager Ben Silverman (Ruiz) to get him a gig doing commercials. Ben tries his best, but Willie has trouble remembering his lines. Meanwhile, Al, who has retired from the business, is dealing with health issues while living with his daughter and her family over in dreaded New Jersey. One day, Ben has good news. A television special about the history of comedy is being produced and wouldn’t be complete without including Lewis and Clark. But can the estranged entertainers stand being in the same room with each other long enough to recreate their famous doctor sketch? Hostilities surface during the initial meeting and escalate during the taping of the special with Sandra Andreas playing the buxom and provocatively costumed nurse (Lisa Loen, design) who is the catalyst for many of the team’s jokes, which often get interrupted by the actors’ feud, all to the consternation of the director (Thomas Brazzle, a recent student at UConn and a noticeable nonEquity member of the cast). The ordeal brings on a heart attack for Willie and lands him in the care of a registered nurse (Tina Fabrique, Ella) who doesn’t take any grief from the old man who needs to make some decisions about where to live and whether or not to see Al again. More impressive than two good actors doing what they do best, however, is how Ruiz, pictured right with Kline, fits perfectly in to the mix. He has stood out in roles at CT Rep’s My Fair Lady, The Music Man and Man of LaMancha as well as in Yale Rep’s American Night, but really shines here. He conveys real affection for his uncle, admiration for Al and somehow manages to be engaging without getting in the way of the veterans. The two-hour comedy with an intermission is the second offering in the Nutmeg series. Next up: Gypsy, starring Leslie Uggams, June 19-29. 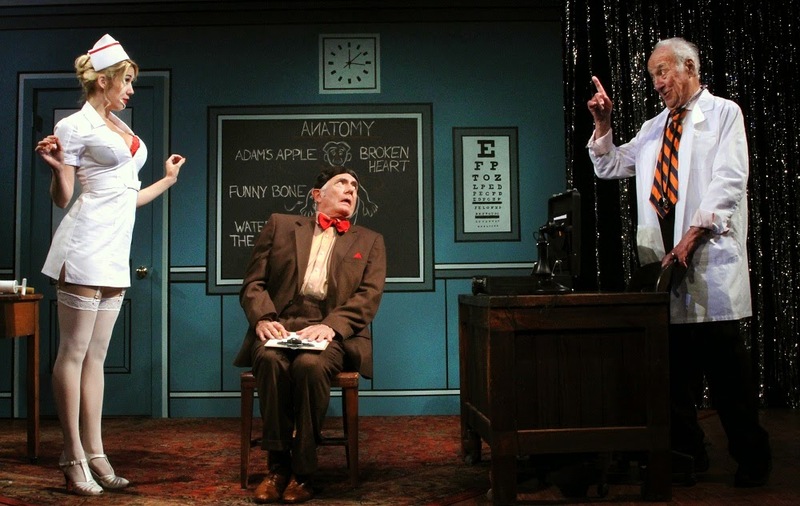 The Sunshine Boys plays through June 29 at Jorgensen Auditorium on the UConn Storrs campus. Showitimes vary. Tickets are $10-$43: 860-486-2113; www.crt.uconn.edu; box office at the Nafe Katter Theatre, 820 Bolton Rd. For a review of The Killer, directed by Darko Tresnjak at the Theatre for a New Audience in Brooklyn, click here. Friday, June 27, 2014 │ 7:30 p.m. Ticket Information: Subscriptions to the 2014 Talcott Mountain Music Festival range in price from $100-$1420; single tickets range in price from $20-$45; and lawn tickets for kids 12 and under are $5. Discounts are available for tickets purchased in advance. 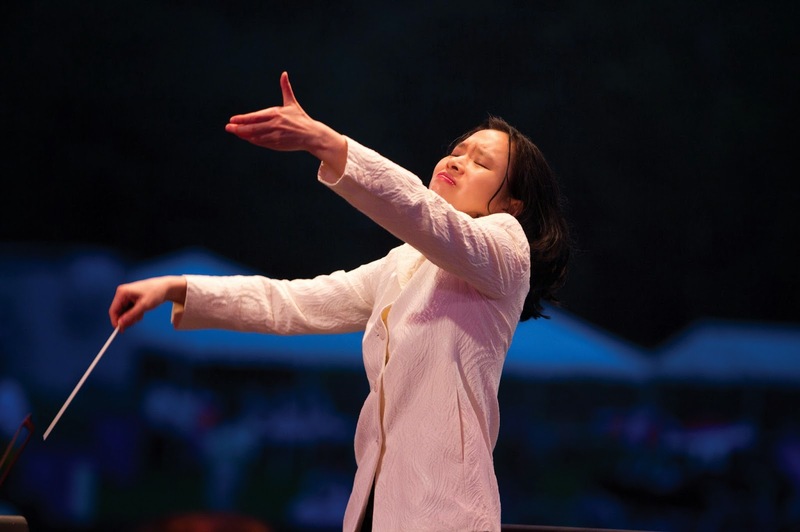 For more ticketing information, please contact HSO ticket services at (860) 244-2999 or visitwww.hartfordsymphony.org. Additional Information: Gates open at 6:00 p.m. for all Talcott Mountain Music Festival concerts. Open to all ticket holders, the HSO Education Tent is open from 6:00 p.m. to 7:15 p.m.; families can enjoy free activities such as music-themed games and crafts, the “Instrument Zoo,” and youth performances. In the case of severe weather, this concert will be performed the following night (June 28) at the same time. Steven Grant Douglas. 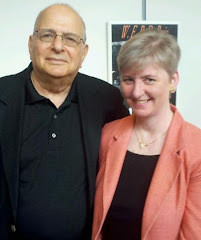 Photo: Joan Marcus..
We’re not supposed to like Carl Bruner. He’s the bad guy. But in the tour of Ghost, the musical, stopping to close out the Broadway season at the Bushnell, we just can’t help ourselves. And we kind of like Willie Lopez, the other bad guy who does Carl’s bidding too. Loyalties are messed up here, because Robby Haltiwanger (Carl) and Fernando Contreras (Willie) are so good at being bad – and they stand out in an otherwise mediocre film-to-stage rendition of the beloved film starring Demi Moore, Patrick Swayze and Whoopi Goldberg. Come to think of it, we also bond with the story’s other less-than-reputable character, Oda Mae Brown, a con artist, fake psychic who discovers, to her amazement, that she really does have the gift, played here with sarcastic humor by Carla R. Stewart. Haltiwanger commands the stage and expertly conveys the lust for wealth and success that leads the banker to hire Willie to rob his friend Sam Wheat so he can obtain passwords to accounts holding money he is laundering for the mob. Haltiwanger also brings energy and a talented singing voice to the tunes written by Grammy Award-winners Dave Stewart (half of the Eurythmics) and Glen Ballard (Man In The Mirror, Jagged Little Pill). Contreras’s role is minor, but he stands out with a menacing drive that has us fearing for Molly (Kate Postotnik) when Willie breaks into her loft to find the passwords he didn’t get when he murdered the love of her life, Sam (Stephen Grant Douglas). We also fear for Molly when evil Carl starts making moves on her, urging her to move on and forget Sam. 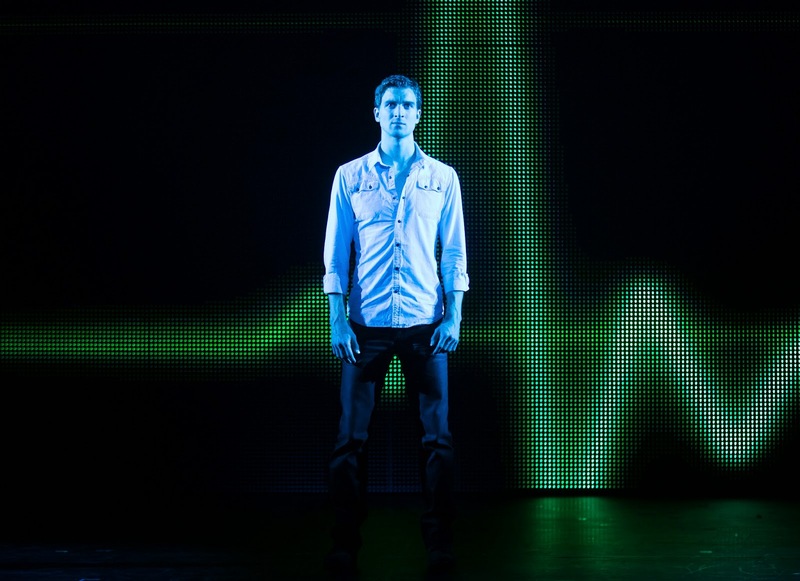 But Sam is there in the form of a ghost (thanks to illusions by Paul Kieve, Video and Projection Design by Jon Driscoll, lighting design by Hugh Vanstone and sound design by Bobby Aitken) and as he discovers the truth about his murder, he concocts a plan with Oda Mae, who is the only one able to hear him, to thwart Carl. Also standing out in minor parts are Oda Mae’s sisters, Clara and Louise (Evette Marie Whit and Lydia Warr), and the subway ghost (Brandon Curry), who gives Sam lessons on how to turn poltergeist. The other ghosts who show up to sing really dumb lyrics and do really dumb choreography (by Ashley Wallen) should be sent to purgatory, however, or at least to a documentary on why film movies don’t always work well as stage musicals. For fans of the movie, a lot of the key elements survive. Bruce Joel Rubin (“The Time Traveler’s Wife” and “Jacob’s Ladder”) recreates his Academy-Award-winning screenplay for the stage, so the pottery scene, “ditto,” and “Unchained Melody,” written by Hy Zaret and Alex North, are in there. What doesn’t materialize, besides Demi Moore’s cute little haircut (why did Director Matthew Warchus insist Molly have long, blonde curls when we all want to see that short, brunette bouncy do?) is a love story we can get teary about. Postotnik is believable, but Douglas is totally miscast in a part that’s too big for him, and both performers at times appear to struggle with the singing. It’s hard to tell though, because the sound mix isn’t good and solos often are drowned out by the musicians or chorus. We also don’t see a bond develop between Sam and Oda Mae. Worse, there is no chemistry between Sam and Molly and we don’t buy them as a couple whose love is so strong that it transcends worlds. Without that, and the neat magic tricks (the ones which aren't totally obvious), this telling of Ghost would be rather transparent if it weren’t for those really good villains. Ghost plays at The Bushnell, 166 Capitol Ave., Hartford, through June 15; Thursday at 7:30 pm; Friday at 8 pm; Saturday at 2 pm and 8 pm; Sunday at 1 pm and 6 pm. Tickets $22-$85 (860) 860-987-5900; www.bushnell.org. Congratulations to Hartford Stage's Darko Tresnjak, winner of the Tony for Best Director for Gentleman's Guide to Love and Murder. 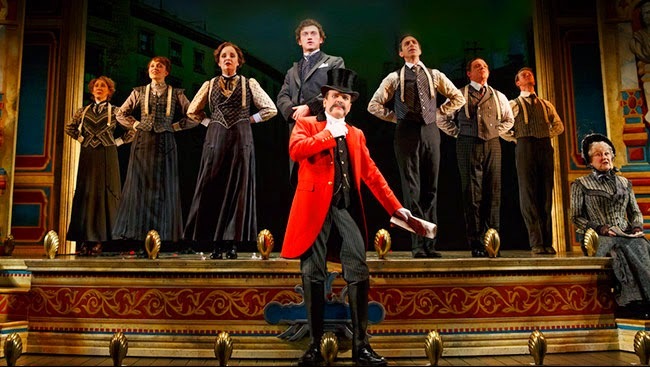 The Shubert Theatre in New Haven has announced the lineup of Broadway shows for its 2014-2015 Centennial Season which will celebrate the 100th anniversary of the Shubert Theatre’s original opening back in December 1914. As part of the Shubert’s Centennial Plan, the Shubert has begun a multi-year project that will improve the theatre’s physical and financial future. In the fall the Shubert will “raise the curtain” on new, improved and expanded public spaces and facilities that will make the patron’s theatre-going experience all the more enjoyable. In addition to the Broadway Series, the Shubert is planning a season of special centennial events to Celebrate the Shubert’s Past and Build the Theatre’s Future. Current Shubert Season Ticket-holders will be receiving their Broadway Series renewals by mail and have the opportunity to renew their current Season Ticket Seats. Season Tickets to the Shubert Theatre’s 2014–2015 Broadway Series are available at the Shubert Box Office and by phone at 203-562-5666 or 888-736-2663 Mondays thru Fridays 10 am to 5:30 pm and Saturdays 10 am to 3 pm. For additional information visit shubert.com. Irving Berlin's White Christmas, the stage adaptation of the beloved classic film, is coming to the Shubert stage this holiday season! The memorable story of two showbiz buddies putting on a show in a magical Vermont inn shines with such Berlin hits as “Count Your Blessings Instead of Sheep,” “Happy Holiday,” “Sisters,” “Blue Skies,” and the unforgettable title song. Full of dancing, romance, laughter and some of the greatest songs ever written, this holiday musical promises a merry and bright theatrical experience for the whole family! Winner of 5 Tony Awards, this grownup’s prequel to Peter Pan will have you hooked from the moment you let your imagination take flight. PETER AND THE STARCATCHER, the innovative and imaginative musical play based on the best-selling novel by Dave Barry and Ridley Pearson, takes a hilarious romp through the Neverland you never knew. The actors play more than a hundred unforgettable characters, all on a journey to answer the century-old question: How did Peter Pan become The Boy Who Never Grew Up? This epic origin story of popular culture’s most enduring and beloved character proves that your imagination is the most captivating place in the world. Based on the Academy Award-winning animated feature film, Disney’s Beauty and the Beast has won the hearts of millions of people worldwide. This eye-popping spectacle is filled with unforgettable characters, lavish sets and costumes, and dazzling production numbers including “Be Our Guest” and the beloved title song. Share this smash-hit Broadway musical with your family! MILLION DOLLAR QUARTET is the smash-hit musical inspired by the famed recording session that brought together rock ‘n’ roll icons Elvis Presley, Johnny Cash, Jerry Lee Lewis and Carl Perkins for the first and only time. On December 4, 1956, these four young musicians were gathered together by Sam Phillips, the “Father of Rock ’n’ Roll” at Sun Records in Memphis for what would be one of the greatest jam sessions of all time. This Tony Award-winning musical brings that legendary night to life with a tale of broken promises, secrets, betrayal and celebrations featuring timeless hits including “Blue Suede Shoes,” “Fever,” “That’s All Right,” “Sixteen Tons,” “Great Balls of Fire,” “I Walk the Line,” “Whole Lotta Shakin’ Goin’ On,” “Who Do You Love?,” “Matchbox,” “Folsom Prison Blues,” “Hound Dog” and more. This thrilling musical brings you inside the recording studio with four major talents who came together as a red-hot rock ‘n’ roll band for one unforgettable night. 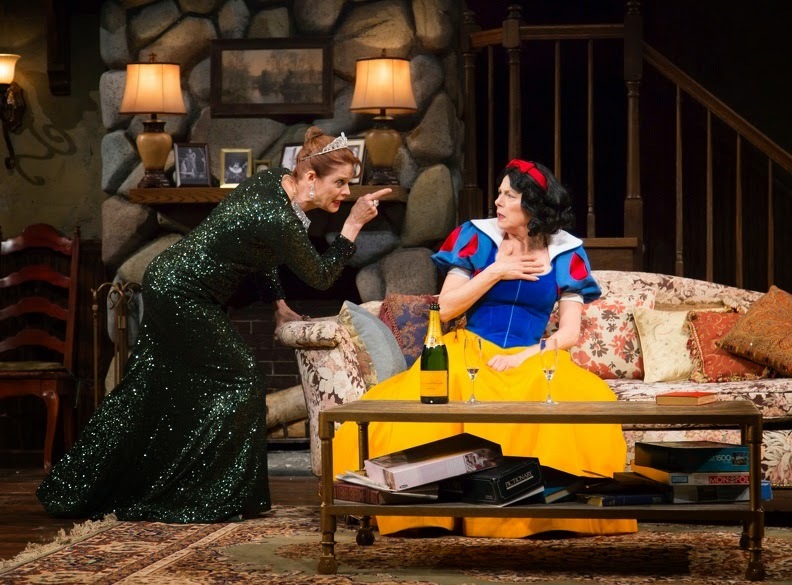 The CT Critics Circle has announced nominations for its 2013-2014 theater awards. 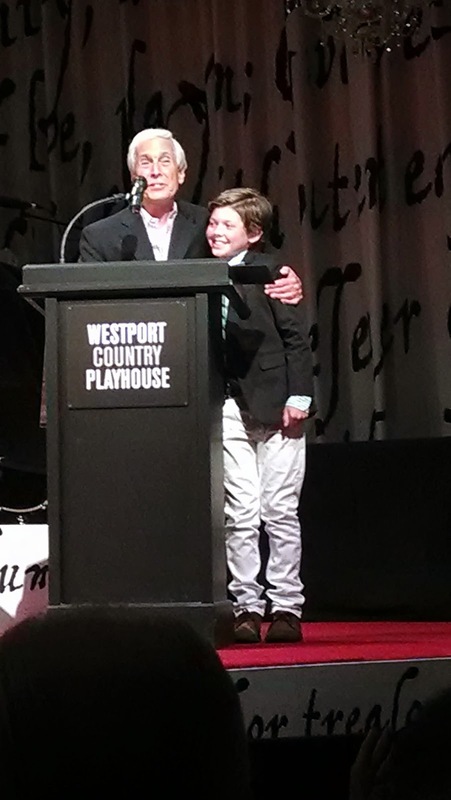 The winners will be announced at a ceremony Monday, June 23 at Westport Country Playhouse. A reception at 6:30 precedes the ceremony, which will begin at 7:30. All are welcome to attend the free event, which is fast becoming the theater-networking event in the state. RSVPs to pblaufuss@westportplayhouse.org.